During the ongoing civil unrest in Kiev, several images have circulated showing Ukrainian security forces equipped with a range of lethal weapons, including sniper rifles. In addition to the SVD type rifles commonly seen, security forces have been documented using a license-produced copy of one of the Brügger & Thomet APR rifles (as seen above). APR rifles are bolt-action sniper rifles produced in .308 Winchester (APR308 series) and .338 Lapua Magnum (APR338). They have guaranteed accuracies of 1 MOA up to 1000 and 1500 metres respectively. The Ukrainian copies are produced under license by Tactical Systems Ltd (TS). According to B&T, the license for the entire APR range (four models) as well as other B&T products was approved by the Swiss licensing body, SECO, in 2009. The TS rifles are known as the TS 308 and TS 338, and are produced in Ukraine and branded with the TS logo. B&T told us there may also be “some technical differences”. According to Konstantin Khurshudian, director of Tactical Systems, TS series rifles were sold to the Ministry of Internal Affairs for use by special security forces during the 2012 UEFA European Championship. Thus far, Ministry of Internal Affairs forces are the only users. The APR range is available with B&T produced suppressors and anti-mirage bands, and B&T branded Schmitt & Bender optics. These are likely available for the TS copies as well. According to the Tactical Systems and B&T websites, TS also distribute B&T produced rifles in Ukraine. TS308 rifle. Image from the Tactical Systems website. 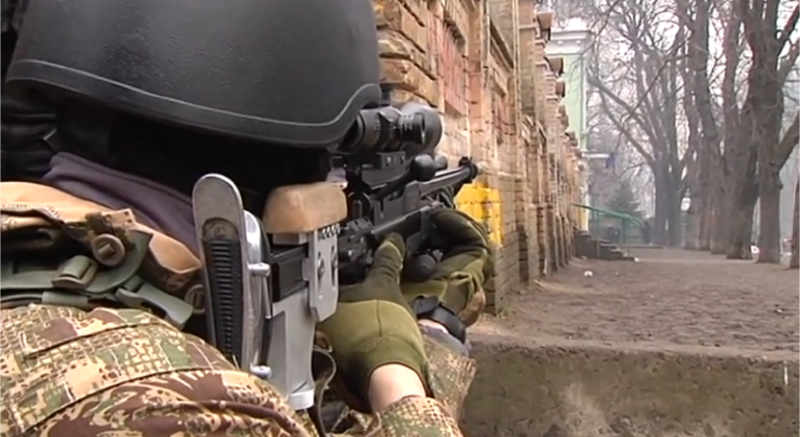 The video below shows Ukrainian security forces equipped with what is likely the TS 308 rifle, fitted with what appears to be a customised buttstock. It is unclear whether these stocks are offered by Tactical Systems, or whether the weapons are modified after purchase by Ministry of Internal Affairs troops. It also features a range of other weapons, including various AK type rifles, SVD type rifles, PKM machine guns, PM type pistols, and what appears to be a Sako TRG-22 sniper rifle. TRG-22 rifles are known to be in use with the Ministry of Internal Affairs’ specialised ‘Omega’ (Омега) anti-terrorist unit. Special thanks to Mari Batashevski. Thanks to Karl Brügger, Jonathan Ferguson, Konstantin Khurshudian, and a confidential source.